The mitochondrial respiratory chain is organized in a dynamic set of supercomplexes (SCs). The COX7A2L protein is essential for mammalian SC III2+IV assembly. However, its function in respirasome (SCs I+III2+IVn) biogenesis remains controversial. To unambiguously determine the COX7A2L role, we generated COX7A2L-knockout (COX7A2L-KO) HEK293T and U87 cells. COX7A2L-KO cells lack SC III2+IV but have enhanced complex III steady-state levels, activity, and assembly rate, normal de novo complex IV biogenesis, and delayed respirasome formation. Nonetheless, the KOs have normal respirasome steady-state levels, and only larger structures (SCs I1-2+III2+IV2-n or megacomplexes) were undetected. 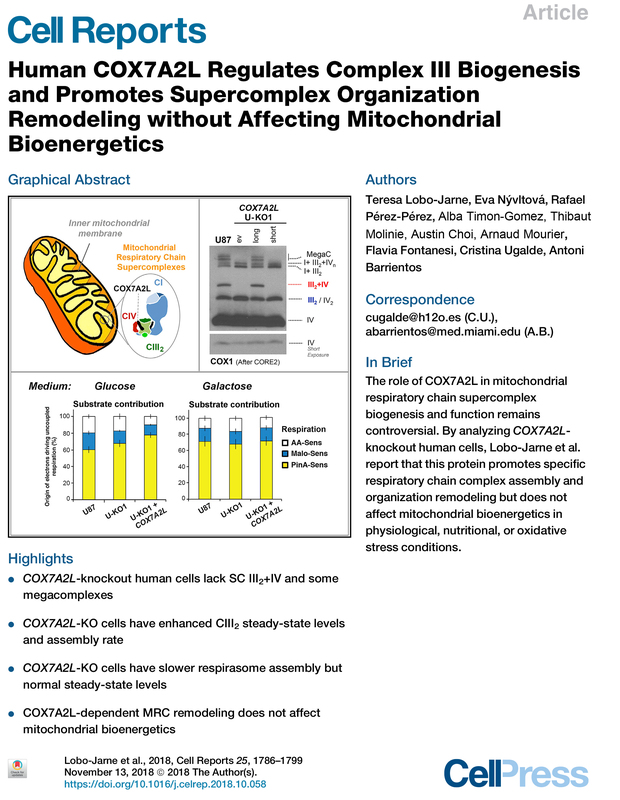 Functional substrate-driven competition assays showed normal mitochondrial respiration in COX7A2L-KO cells in standard and nutritional-, environmental-, and oxidative-stress-challenging conditions. 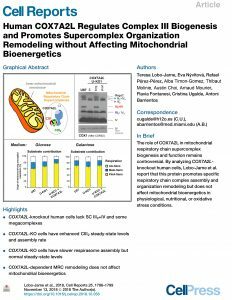 We conclude that COX7A2L establishes a regulatory checkpoint for the biogenesis of CIII2 and specific SCs, but the COX7A2L-dependent MRC remodeling is essential neither to maintain mitochondrial bioenergetics nor to cope with acute cellular stresses.